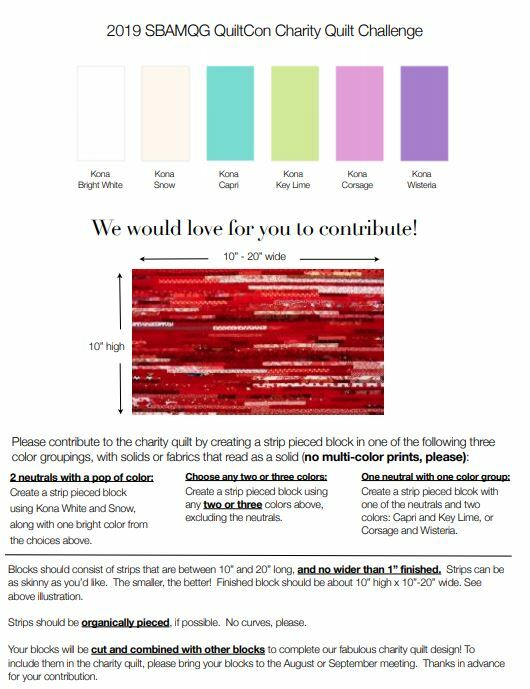 Join us in making our 2019 QuiltCon Charity Quilt using the guidelines below. 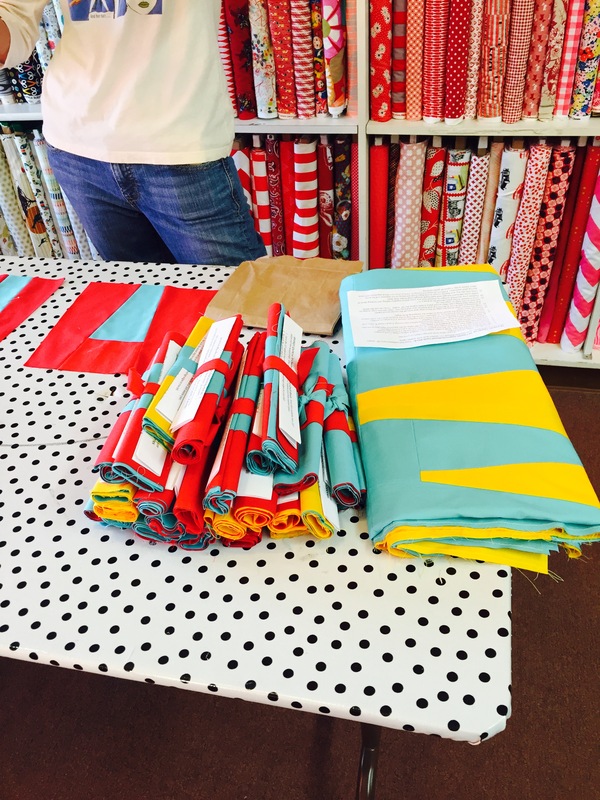 We will be making blocks at the July 14th Sew Day, some fabric will be provided, but feel free to bring strips from your stash to include in the blocks! Blocks will be collected at the August & September Guild Meeting. We thought it would be fun to use 3”, 6”, and 12” orange peel blocks. The varied sizes allowed us to play with the overall layout and add interest to the design. 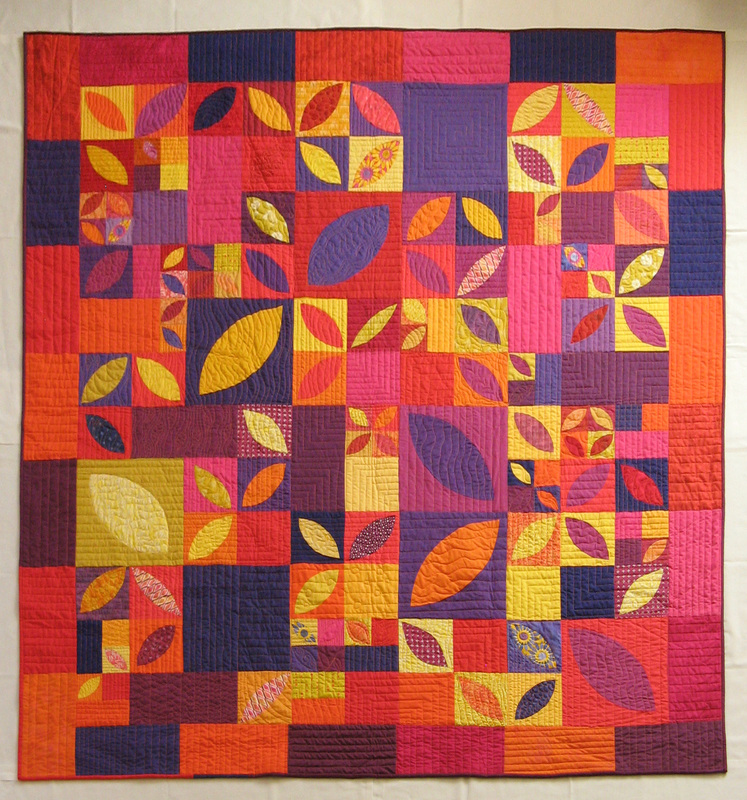 We chose vibrant colors from the palette offered by the MQG – yellow, orange, pink, magenta, and violet. Our members worked hard over the summer to create many awesome blocks for our quilt. 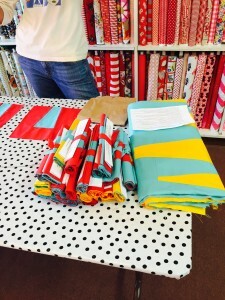 At the September guild sew day, we worked on our layout. 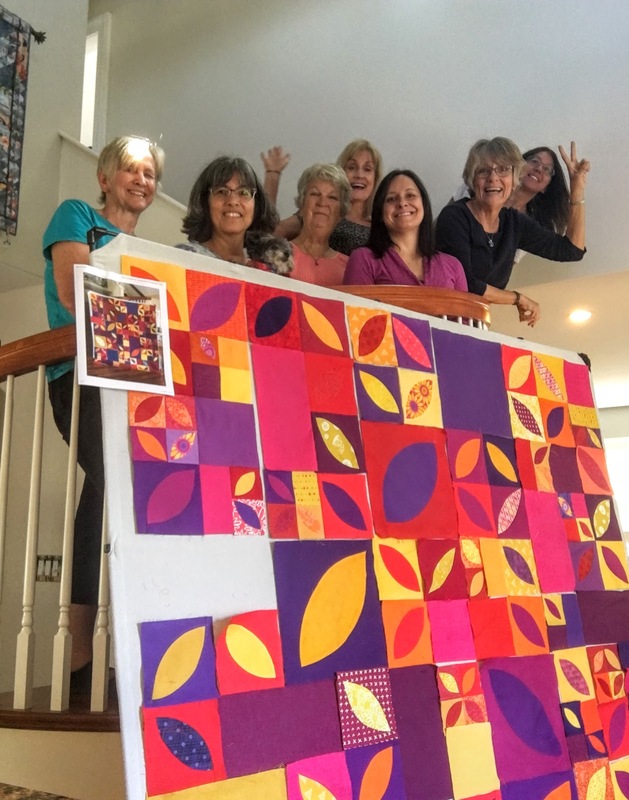 The first weekend of October was our Charity Quilt sew day. 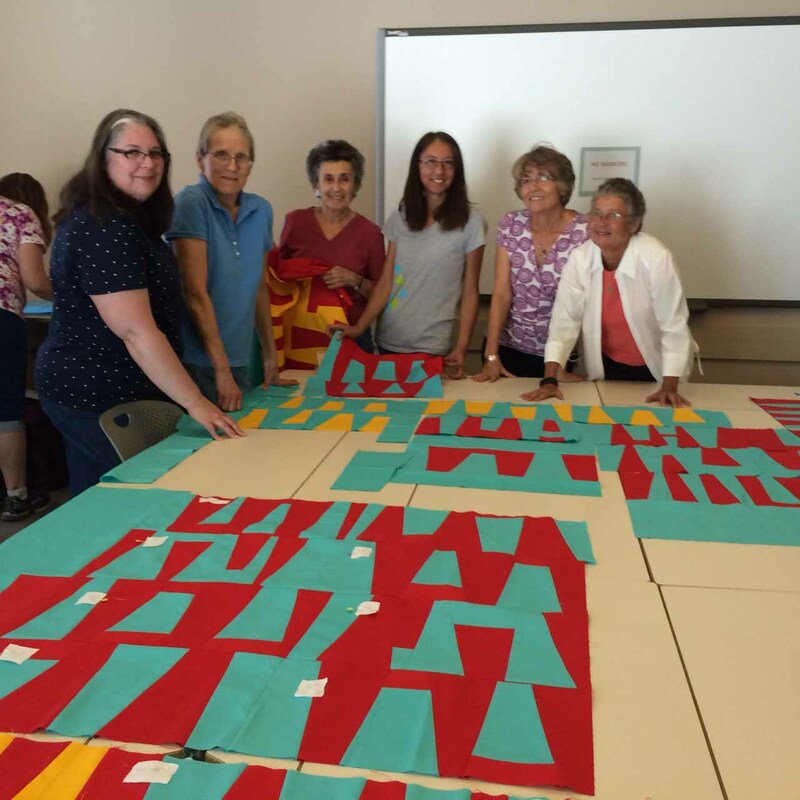 The charity quilt committee members worked together to create the final layout and construct the quilt top. We had fun moving the blocks around, playing with color and shape, to come up with just the right layout. Pictured below are committee members Mickey, Laura, Pat, Barbara, Isabelle, Lori, and Karen. 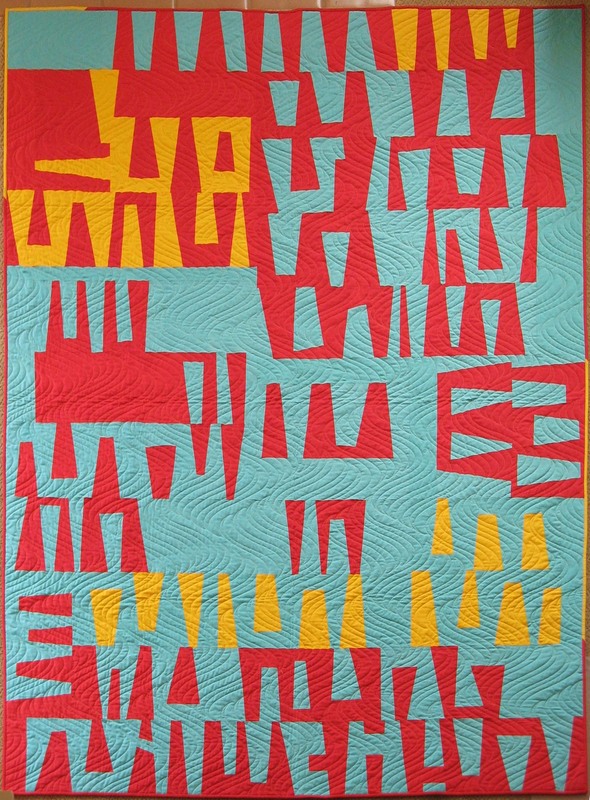 Once the quilt top was complete, it was handed off to Laura Ryle for quilting. 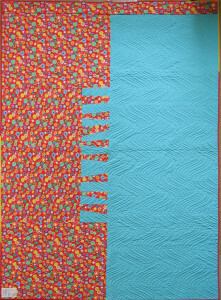 She worked over the month of November to add beautiful quilting and texture that perfectly complimented our block design. 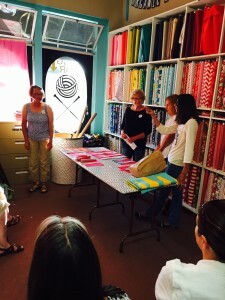 Our guild president, Chelsea, added a the binding and label and Lynne added the hanging sleeve. 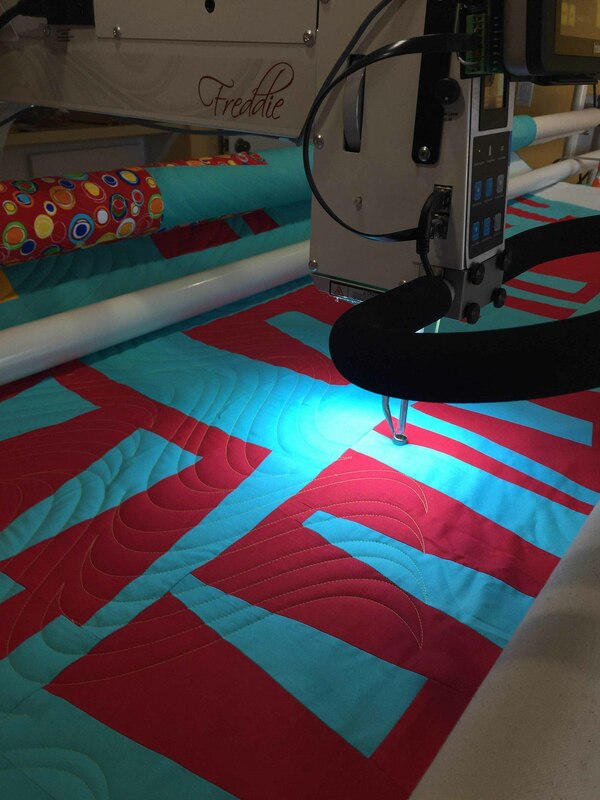 Pam Rocco took photos of the finished quilt, then packed it and shipped it off to the MQG for display at QuiltCon! The charity quilts at QuiltCon are such a beautiful representation of the diverse and talented members of Modern Quilt guilds around the world. 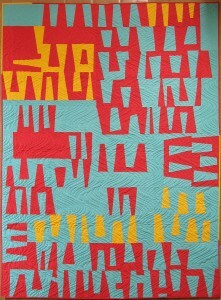 Our quilt was displayed in the lecture room, along with many beautiful others. 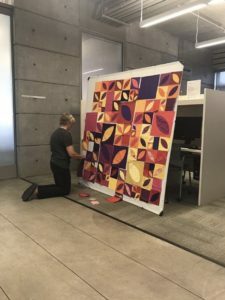 The 2018 South Bay Area Modern Quilt Guild charity quilt was donated to Happiness Is A Warm Hug. The local group collects donation quilts, fabrics, and pillowcases, and distributes them to families that were victims of the 2017 Napa and Santa Rosa fires. 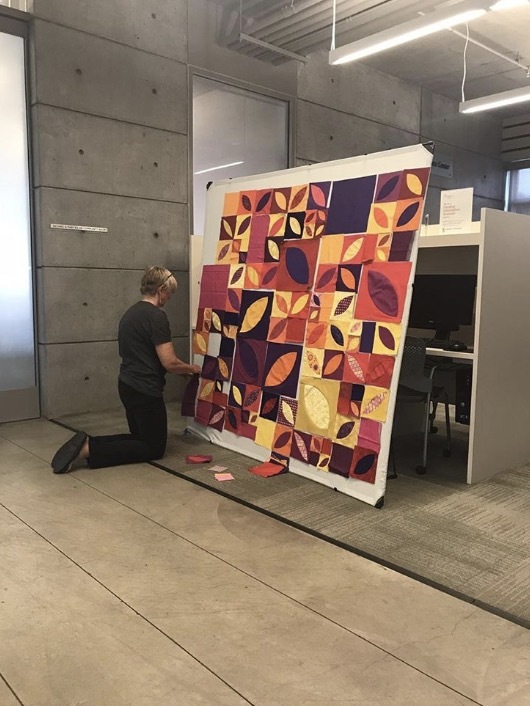 Thank you so much to all the participants of the 2018 Charity Quilt committee, and all those from the guild who participated in creating this beautiful quilt. 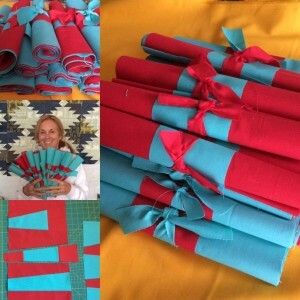 We hope you’ll join us as we get started creating our quilt for next year! 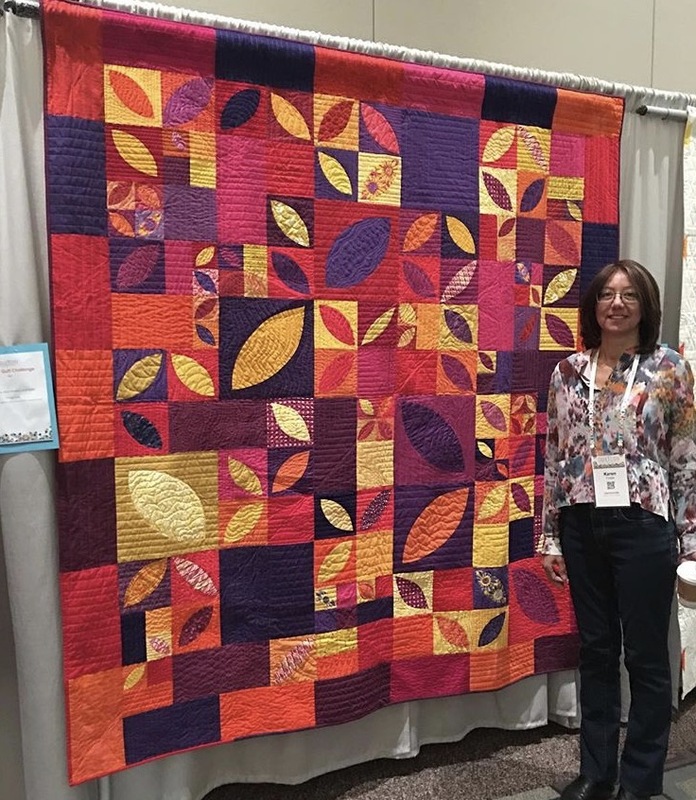 We had a fantastic March meeting with lots of exciting discussion surrounding those of us who attended Quiltcon as well as the PVQA quilt show. 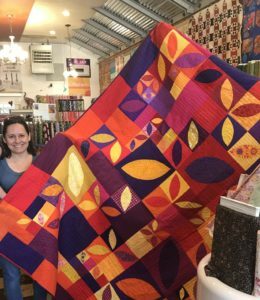 This gorgeous quilt will make its way to a family who was directly affected by the Napa/Sonoma wildfire. We are thrilled to be able to give directly in this way and reminds us of the importance of service to others and how what we make can truly offer comfort and warmth. We announced our newest swap! 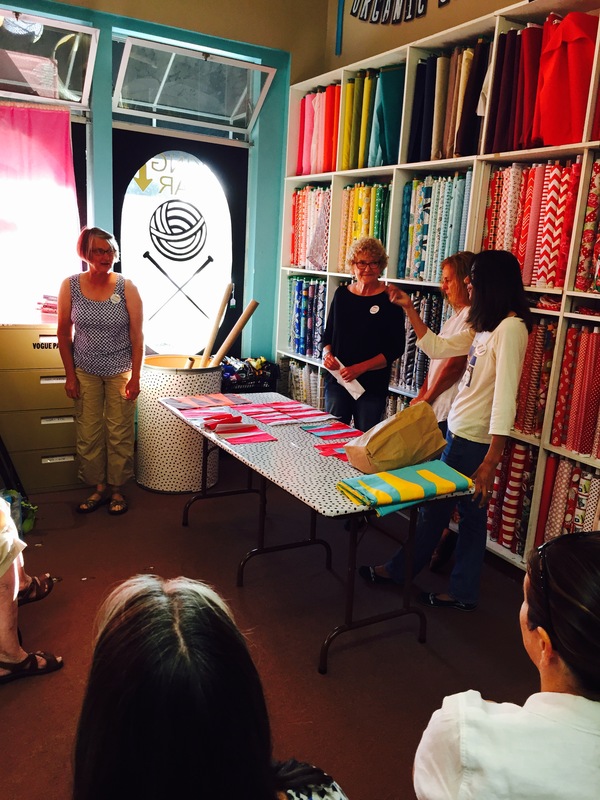 We are excited to host a tote bag/zipper pouch swap. 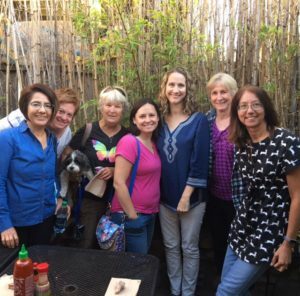 It’s not too late to join – next month’s meeting there will still be an opportunity to join in on the fun. 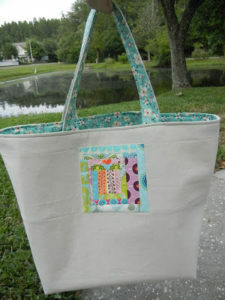 If you’ve never made a tote bag or a zipper pouch don’t fret or dispair! 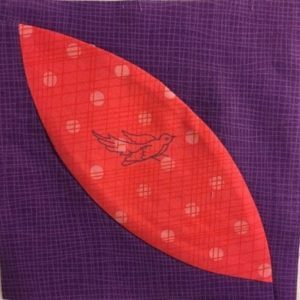 Next month there will be a separate blog post with LOTS of links to the many free tutorials and free patterns for making a tote. We promise – it’s fun and simple. Your desire to make something that your swap partner may enjoy is the only requirement. It’s going to be fun so please join in! We know you can do it! Wouldn’t you like to receive something like this? 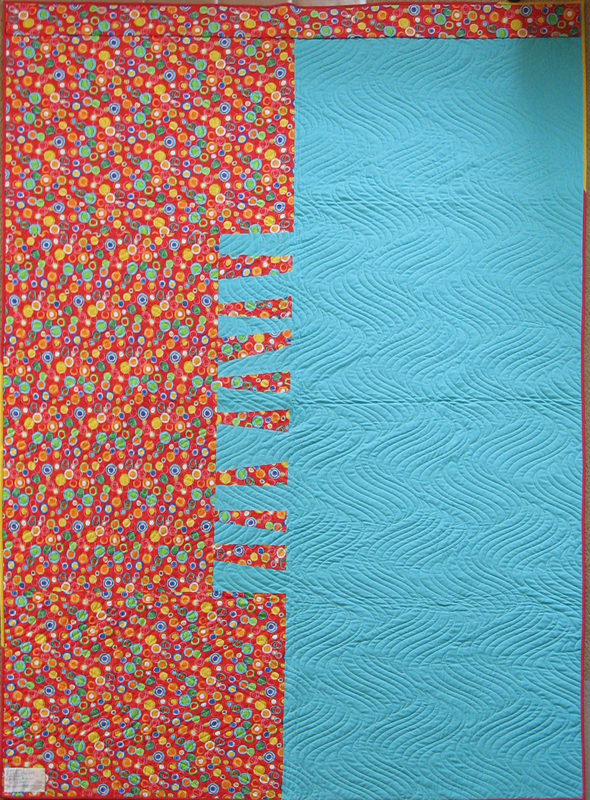 Our next block of the every other month is from Renee (@uniquilter). 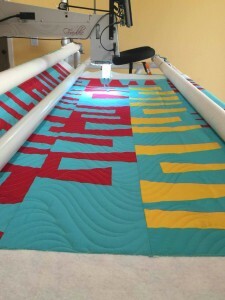 Her block, “side stripe”, is featured on the MQG site! We’re so proud of you Renee! And please remember, we are still taking sign-ups for our Mel Beach workshop! We hope to see you at our next meeting which is April 3rd at 6:30. 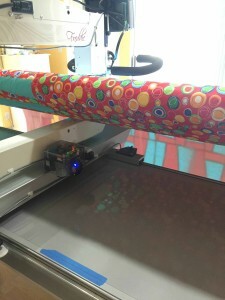 We’d love for you to contribute! Blocks should be 3.5″, 6.5″, or 12.5″ unfinished. Please leave at least 1/4 inch around the orange peel, so we don’t lose your beautiful work in the seams! To include them in the charity quilt, please bring them to the August or September guild meeting. In addition, we created some 3″ and 6″ templates you are welcome to use. 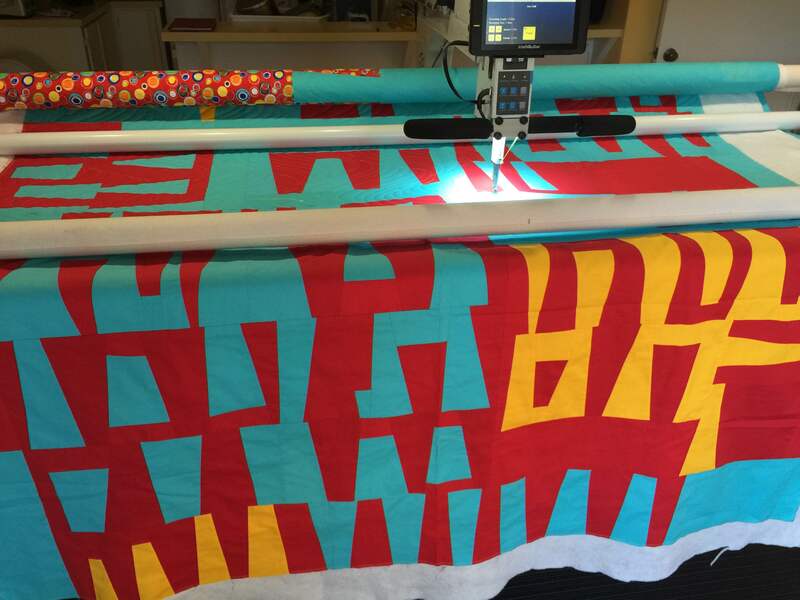 We South Bay Area Modern Quilt Guild members are getting excited for QuiltCon West, 2016! 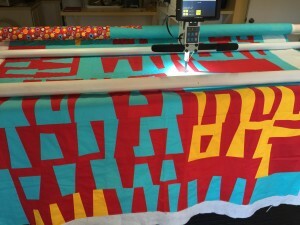 This annual quilt show, presented by the Modern Quilt Guild, is happening in California this year – Pasadena, to be specific – and we are getting ready for four days of fun, artistry, creativity, lectures, exhibits, workshops, volunteering, shopping, and a world of modern quilts! 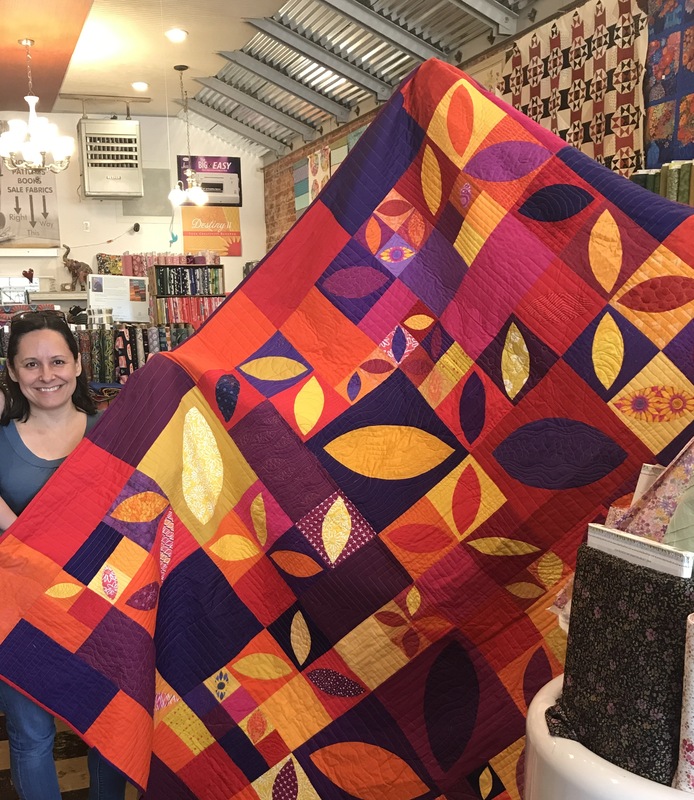 Our charity quilt committee, led by the incomparable Pam Rocco, has been meeting periodically throughout the past year to plan and complete two beautiful donation quilts and this is the second of the pair. 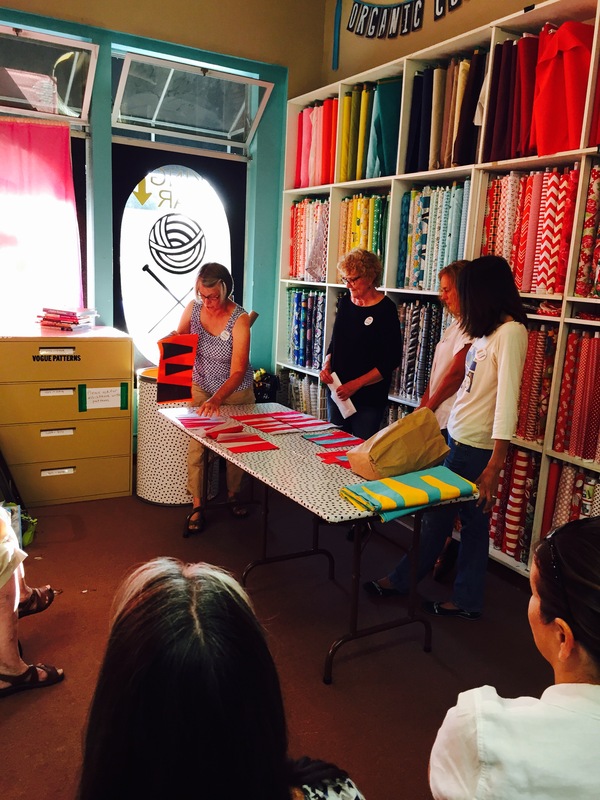 Pam and her group of quilters came up with a plan to use wedge-shaped pieces for our “Improv with intent” themed quilts this year. They chose three colors from the selection given by the MQG in order to stick with a simple, minimal look. Committee members Donna Lehnhoff, Katherine Moody, Pam Stein, and Karen Foster share their design plan and demonstrate how our guild members can participate in the making of the quilt by building rows of wedges. Our super organized committee even put together packets with guidelines and tips for making the improv rows. 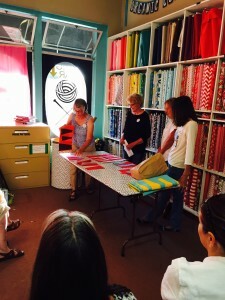 Pam Stein shows off more packets. 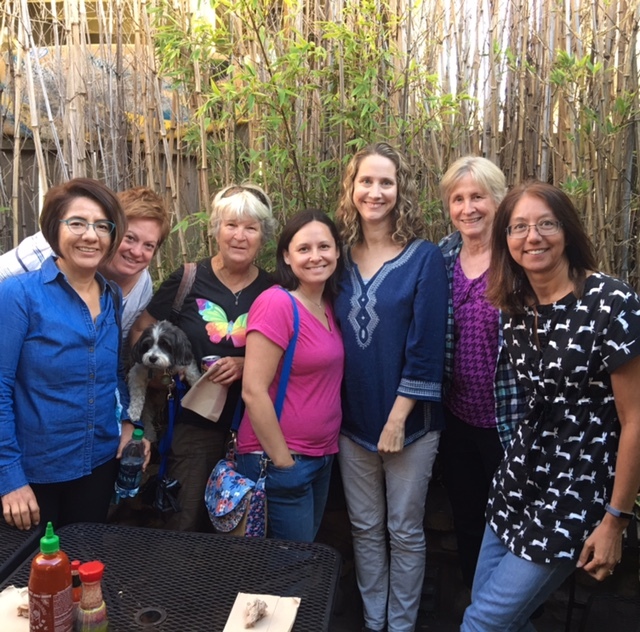 Here are committee members, Tami Levin, Pam Rocco, Carole Kelley, Karen Foster, Lori Green, and Jeannie Land, hard at work. 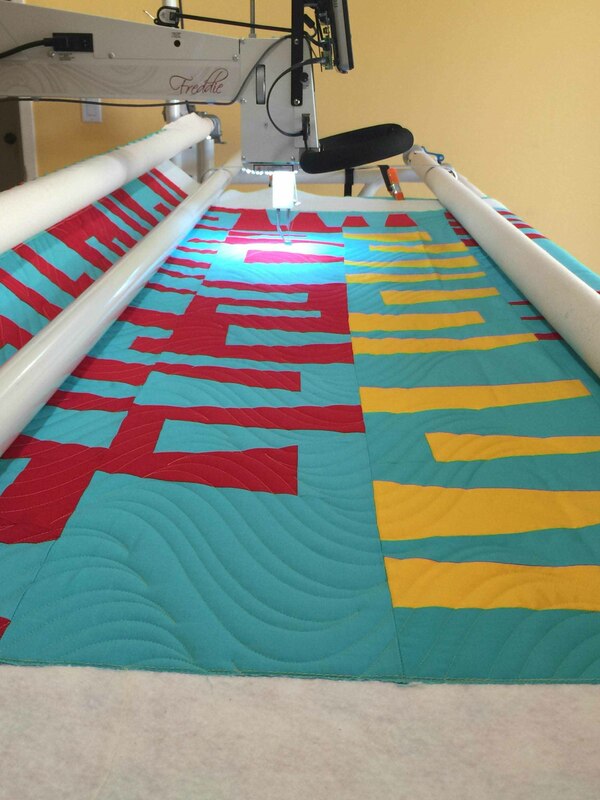 The finished quilt top was then sent to our secret weapon, Tami Levin of The Quilted Lemon, for its finishing treatment: long arm quilting in a wonderfully curvy design for a soft, beautiful texture. 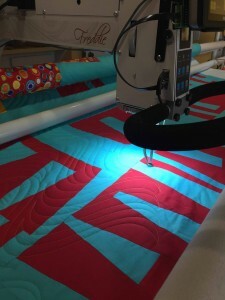 Here is the quilt on Tami’s machine. Such a great marriage of lines and curves! 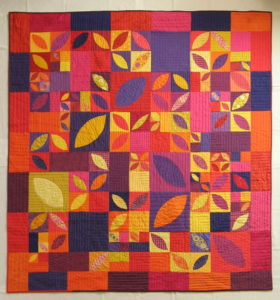 The fun, bright, circles on the back really add a lot to the finished quilt.